its ability to design and manufacture pressroom-automation equipment, presses, tools and complete production lines for the sheetmetal and tube-forming industries. Among its areas of expertise: hot stamping, plate heat exchangers, deep drawing, ventilation and hydroforming. 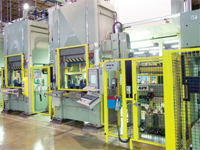 The firm also specializes in retrofitting press-loading and transfer equipment.